A spicy tuna tartare (£14.50) was gorgeous. 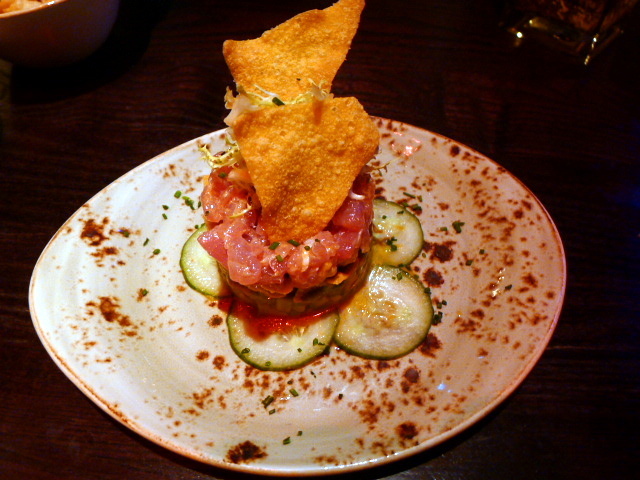 The mixture of tasty tuna with a spicy sriracha sauce was delicious, and it married perfectly with some earthy, creamy avocado and crunchy fried-wonton chips. The scallops in a scallop ceviche (£14.50) with shiso leaves and tobiko were glorious for they were sweet, fresh and delicate. 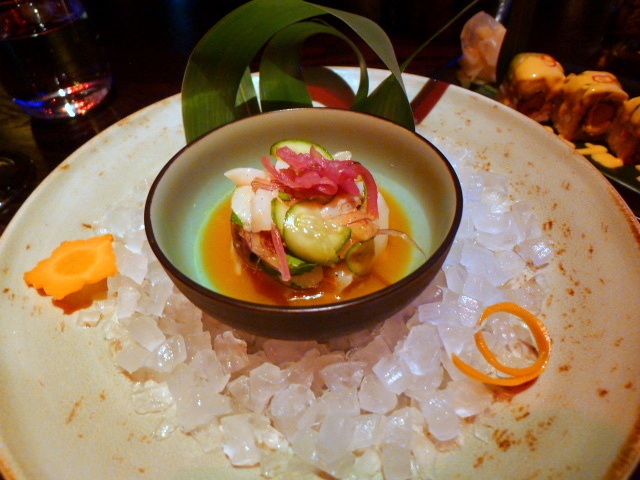 But the ceviche sauce with yuzu and lemon was extremely acidic and overpowered the delicacy of the scallops. A rainbow inside out roll of king crab topped with 7 kinds of seafood (8 pieces – £17.50) was not the best for some of the seafood was not entirely fresh. 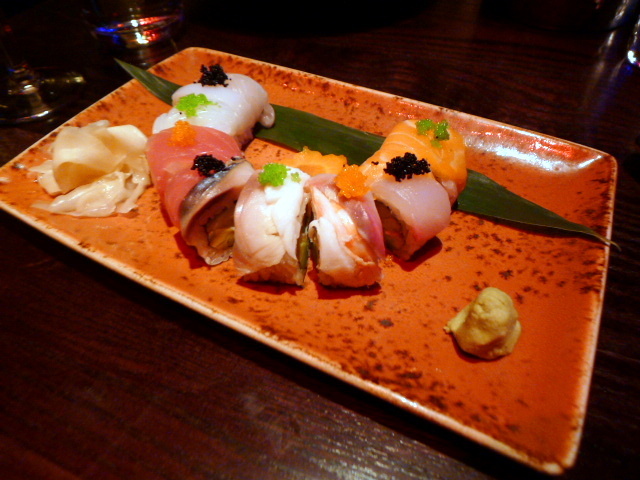 The combination of seafood in the roll depends on what’s available on the day. For our seven we had mackerel, squid, tuna, salmon, yellowtail, scallop and seabass. 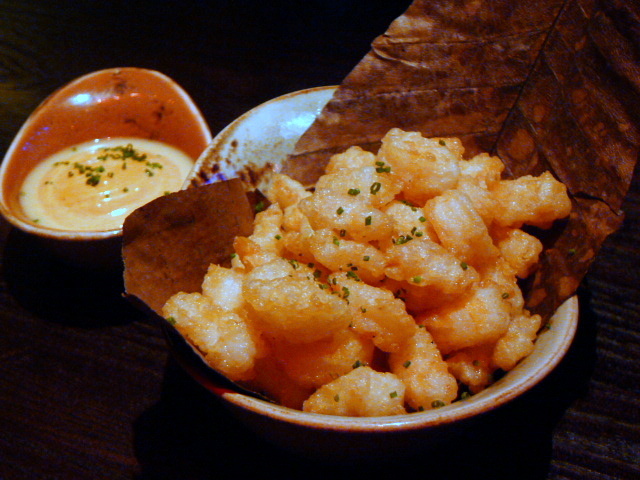 Moving onto the hot food, and a prawn tempura ‘rock shrimp style’ (£14.50) of small pieces of deep-fried prawns was well seasoned and really moreish. The prawns were firm and tasty, and the batter was super-crunchy even though it didn’t flake like an authentic tempura batter should. The prawns were cut into very small pieces however, and had they bigger there would have been a better ratio of prawn to batter. 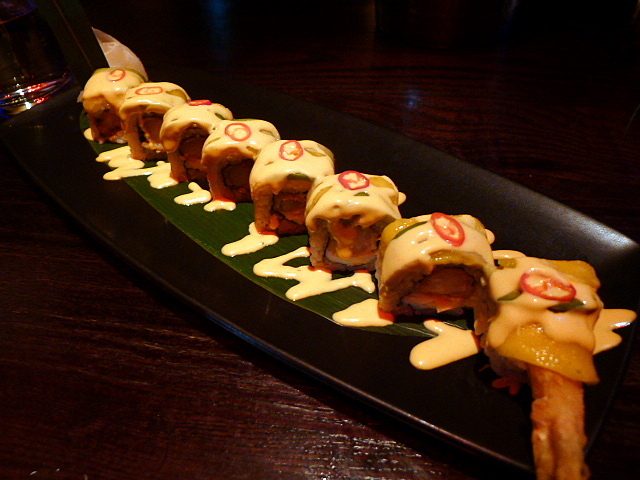 A creamy spicy sauce of yuzu mayo complemented the prawns nicely. 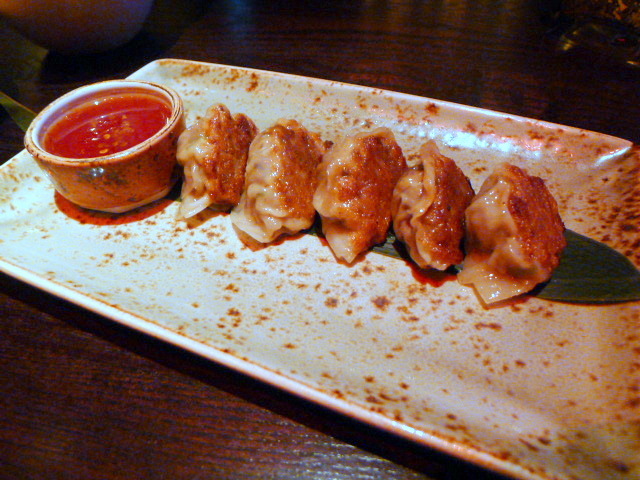 A smoked duck gyoza (£14.50) with a sweet chilli sauce wasn’t particularly smoky, but the filling was meaty and juicy, and the pastry was crispy. 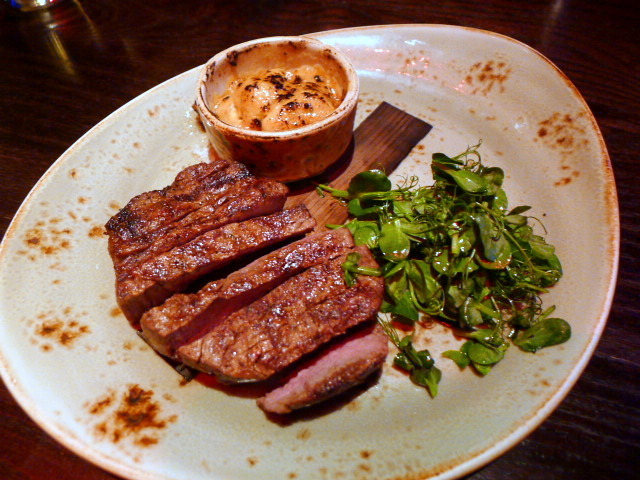 We also enjoyed a grade 5-6 Wagyu beef fillet (120gr – £52.50) as it was tender with a rich beefy flavour. But it was missing the fatty marbling effect that I was expecting from wagyu. It was also a touch grainy, and the cook on it was more medium than medium rare. The accompanying truffle miso butter was a good fit for the wagyu and had a luscious texture. It was aromatic from the truffle, but it was also quite salty. 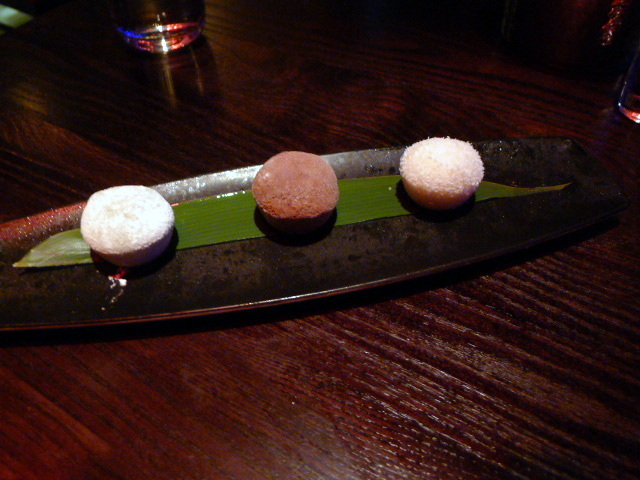 To the desserts, and a selection of ice cream mochi (£7) showcased a mocha casing that was authentic in taste and texture, albeit a little lacking in thickness. Of the three ice cream fillings that we chose (there were about six choices), a fragrant coconut was the best. But a green tea was a little too bitter, and a salted caramel was too sweet and lacking in saltiness. 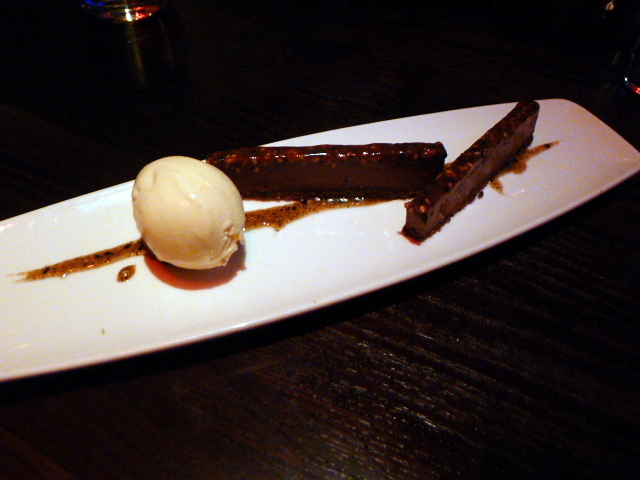 Chocolate caramel and salted sesame bars with vanilla ice cream (£8.50) did not appeal. It was lacking in a distinctive chocolate and caramel flavour, and it was not particularly sweet. We adored some of the dishes, but there was also an inconsistency in the standard of the cooking that meant we enjoyed other dishes less. That said, it was a satisfying meal overall. But it’s also worth noting that a premium has been factored into the pricing to account for the Knightsbridge location. As for the service, we couldn’t fault it. Our waiter was great and completely charmed us with his accommodating touch, easy manner and genuine smile. Prices: About £28 to £80 for three courses, excludes drinks and service.